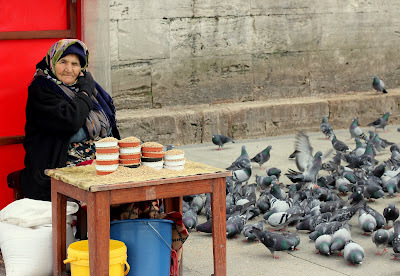 "Seed Seller at Yeni Jami Mosque"
I have been following your blog from some time now, always found it very interested and recent images you have added are great! It looks like you have been to Turkey recently? I am planning for a honeymoon to Istanbul, do you recommend this place? Are there any other places to visit nearby Istanbul? I'll appreciate if you can reply me on this. Salaams Tauqeer: Thanks for reading here and for looking at my photographs. Yes, I returned from Istanbul a few weeks ago. I was also there last year. When are you getting married? I ask because plane fare from USA in March and April is VERY reasonable. After that, the costs go up. I highly recommend Turkey, especially Istanbul. So much, that I would live there if I could! For what to visit, if you have never been there before, I'd start with the typical tourist sites: The Blue Mosque, The Sulymanye Mosque, The Fatih Mosque, the area of Fatih itself, Yeni Jami mosque, Aya Sofia, a boat tour on the Bosphorous, the Panorama Museum, the Sisterns, the Galata Tower. There's a start, lol. Just walking around in Istanbul is a pleasure, especially in the Fatih area. Shopping is the best in Fatih. Be careful of prices. If I shop in the street, I offer half of what they want, and then bargain from there. I usually end up at half or 75%. You can't barter in the actual stores though unless you buy quantity. For example, I bought 10 hijabs in a place and got a discount. If you use cash (Turkish lira), you will get a significant discount as opposed to using a credit card. If is especially helpful if you have Turkish friends to have one off them bargain for you. If you want to reply to me privately, write me at Jihadlevine at Yahoo dot com. Mabrook of your marriage! Randomly stumbled upon your blog! MashaAllah I find the Turkey related photography amazing! Your blog is now in my RSS reader :-) . @contemplationsintransit again: sorry, "wa Alaikum as Salaam" !!! Interesting history about this lady. It's curious too see what people do to win some money.